Berlin based artists unleash an army of Unicorns in a parody strike against the global weapon industry. The unicorns disguised themselves as blood money makers Heckler & Koch, Germany’s largest exporter of hand guns to America. Pirating 300 letters addressed to Gun shops that sell H&K guns PENG Collective stirred up some serious confusion as they decided to speak on behalf of H&K calling for An Immediate Nationwide Recall of All Its Products after a sudden realization that their business was in fact highly unethical. Oh, Heckler & Koch, if only you would wake up, if only you would stop promoting your selves as being in the business of peace building. We don’t see any olive branches nor conflict resolution in your press releases? What we see is a death machine that is contributing to the problem not the solution. We think H&K are actually in violation of the German Constitution, Article 26, which states that Germany having learned its lesson a little while back commits itself never to disturb world peace ever again. Not only are H&K in violation of this emblematic law but they are building their first death factory on US Soil in the good old state of Georgia for more and more guns?!? Hell NO!! The pirated letter was our weapon of hope! This little ditty reached 300 gun retailers in the north east, spread tactical confusion in alt-right gun forums, and even made it on the evening news. So, H&K finally called us but they thought they were speaking to an angry gun shop owner from Pennsylvania named Grant Kingsley. 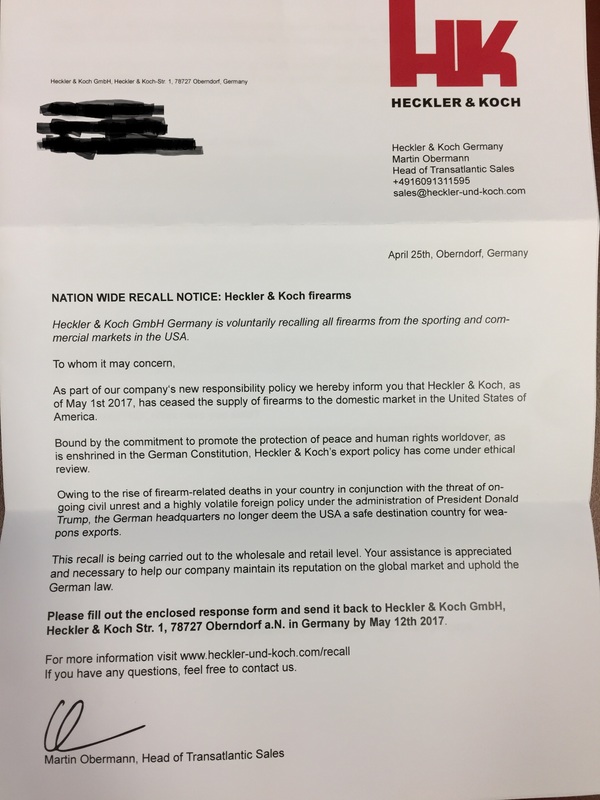 Mr. Steve Galloway, the director of communications at Heckler & Koch told “Grant” that the letter was not real and in fact H&K had been the victims of a vicious cyber-attack. Victims?? How can you even utter that word? Do you kiss your mother or your children with that filthy mouth? You should be ashamed for even uttering the word victim. Let’s be clear, you are not the victim, you are the perpetrators. According to the Gunviolencearchive.org in 2016, there were 15,052 gun related deaths in America what percentage of those deaths were implemented by the guns that your company manufactures? We of Peng are called to take action against this powerful beast! Peng are a group of activists who cooperate with the YesMen and other social/political groups from around the world. Earlier this week, they subverted the Associated Press with a hoax that made it to Fox News, the New York Times and Radio Vatican.